You don't have to do anything out of the ordinary when you make your first appearance at the ceremony and reception at our beautiful wedding venue in Tennessee, but some couples prefer to surprise their guests with something unique. Your imagination can most likely come up with all kinds of creative ideas, but here are a few from Country Jewell to get you started. Some work better for a ceremony entrance, others are best for entering the reception, and many could be used for either one. Each of you can be dropped off separately at the top of the ceremony aisle in a unique vehicle. The person walking the bride down the aisle could also be in the vehicle or just waiting at the top of the aisle. The transportation could be a horse-drawn carriage, vintage automobile, or even a bicycle, possibly one built for two. You could also look to your professions for inspiration, for example, if you're marrying a fireman or policeman, use a fire truck or police cruiser. This type of entrance would work equally as well for your reception entrance too. The tradition of a father walking a bride down the aisle comes from a time when she went straight from her parents' home to one with her new husband. This meant the father was "giving her away" to the groom. Today, many couples are getting married after years of living on their own or even living together. If you don't feel like you want someone symbolically giving you away, you and your groom can walk each other down the aisle, entering your new life together as a unified force. You've likely seen many videos of wedding parties entering both ceremonies and receptions with a choreographed dance. If you and your friends are the goofy, fun-loving type that would really get into a performance like this and enjoy it, go for it. Pick a song that sums you up as a couple and put on your dancing shoes! A variation on the choreographed entrance is to bring a few of the wedding guests in on the show too. This would be much more of a stand-out surprise at the ceremony, but it could work well at the reception too. Have the wedding party get the moves started, and just when everyone thinks that's the big surprise, slowly have some of your guests join in one at a time until a whole bunch of people are a part of the entertainment. If you are getting married someplace with doors, keeping those closed until the big moment and then opening them for a grand entrance is simple. If your venue doesn't have doors, like our outdoor wedding gazebo near Knoxville, you can make your own. 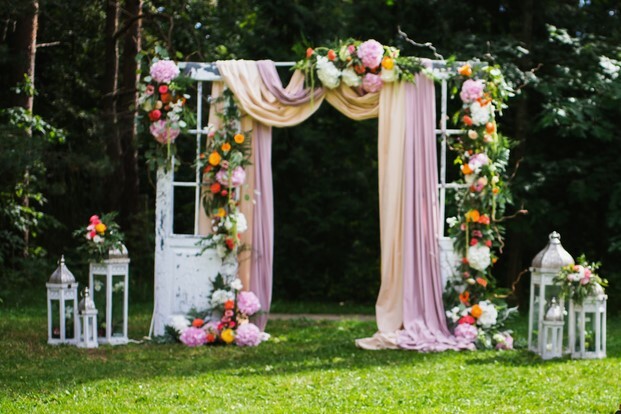 It could be an actual door decorated and set up for the bride or the couple to hide behind, or possibly an arch with a curtain to pull aside for the big reveal. For couples that are huge sports fans, consider entering like your favorite team. You could have the wedding party hold up a big banner announcing the new Mr. & Mrs. for the two of you to break through. Another idea is to have them form a tunnel and you can enter running underneath their arms. You could even have the maid of honor and best man hold up ends of a streamer for the two of you to run through, like a symbolical finish line. Creative lighting and a projection screen can allow you to begin your entrance in silhouette before the grand entrance when you step out from behind it. For a silhouette reception entrance, consider starting your first dance in shadow, and when the music swells, twirl yourselves out into the spotlight. You can use specialty lighting to set the mood as you enter the room. Many DJs have special lighting equipment that can do all kinds of exciting things. You could have pictures displayed around the room, sayings, your names or a monogram. Another idea is to use a different colored light for the entrance of each member of the wedding party, leading up to multiple colors and flashing lights for the new Mr. & Mrs.
Shower yourselves with something festive as you walk into the reception room. You could set up a balloon drop, or drop something smaller like confetti or a bunch of rose petals. It will all look amazing falling around you and will add to the decor for the rest of the evening. In addition to the two of you and the wedding party, enter the reception parade-style with extra people. You could hire dancers to surround you or have a live singer lead you in like a grand marshall. For the bride's ceremony entrance, instead of just one flower girl dropping petals, use an entire group of them to parade in skipping and cascading flowers down the aisle. That should be plenty of different ideas to get your own creative juices flowing while you plan your entrance to our rustic wedding venue near Knoxville. We'd love to hear all about any additional possibilities you can come up with too! Now that we've got you into Country Jewell, next week's blog will be filled with ideas on how you can make a creative exit.